(Nanowerk News) Ethylene (ethene, CH2=CH2) is a primary feedstock for chemical industry, and particularly for the production of plastics like polyethylene and polystyrene. Ethylene is currently made by the steam cracking of fossil fuel fractions. A possible alternative to this may be the production of ethylene from methane (CH4), because although fossil fuel supplies are slowly declining, methane is still found in giant natural gas deposits. The problem is that the carbon–hydrogen bonds in methane are very difficult to break. It thus usually takes extreme conditions to induce the carbon in methane to form bonds with other carbon atoms. Furthermore, this reaction usually produces a mixture. Scientists working with Thorsten M. Bernhardt at the University of Ulm (Germany) and Uzi Landman at the Georgia Institute of Technology (Atlanta, USA), have now found a process by which methane can be selectively converted into ethylene at low pressures and temperatures. Free gold dimers catalyze the reaction, the researchers report in the journal Angewandte Chemie ("Methane Activation and Catalytic Ethylene Formation on Free Au2"). Whereas one methane molecule is not dehydrogenated by free gold-dimer cations, the cooperative interaction of two methane ligands initiates a catalytic formation of ethylene. The cycle is closed by the adsorption of a third methane molecule that cooperatively activates the release of ethylene (see scheme yellow Au, green C, blue H). This cycle is derived from ab initio calculations and gas-phase reaction kinetics measurements. “Methane activation, meaning the ‘cracking’ of C–H bonds, is a very complex process,” explain the scientists, “which must be understood at the molecular level before practically applicable catalytic processes can be developed.” To investigate this, the team carried out experiments with different catalytic metal clusters (aggregates of a few metal atoms) as model systems. 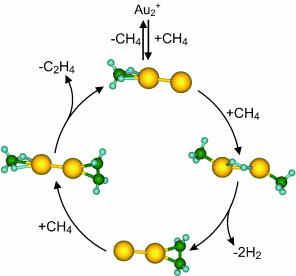 In tests with particles made of a few gold atoms, they found that positively charged particles made of two gold atoms (Au2+) selectively convert methane into ethylene in the gas phase. Through experiments in which intermediates of the reaction were “trapped”, as well as model computations, the researchers were able to formulate a reaction mechanism for this catalytic cycle. Each gold atom of the gold dimers binds to a methane molecule; hydrogen is split off and the two carbon atoms form a single bond to each other. This ethylene precursor initially remains bound to one of the gold atoms, and the freed gold atom binds to a new methane molecule. In the last step, another methane molecule displaces the ethylene precursor from its spot on the gold atom and ethylene is released. At this point the reaction cycle can begin again.